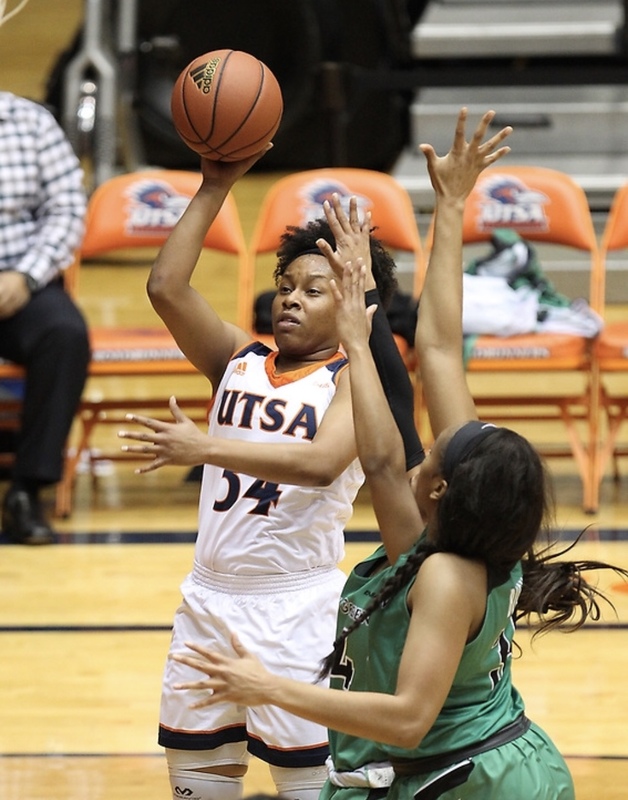 After losing four of their last five games, the UTSA women’s basketball team hoped to get things rolling as they took on North Texas at home last Friday. The task would not come easy as the Mean Green are top three in C-USA in scoring defense, turnovers forced and fewest turnovers per game. The Roadrunners took the lead early in the first quarter of the game as senior guard Carlie Heineman caught fire from the three-point line. She drained three of them to help give the ‘Runners a 19-14 lead over North Texas in the first quarter. The UTSA defense was able to hold the North Texas offense to zero percent from the three-point line by the end of the first quarter. UTSA got off to a rough start in the beginning of the second quarter, as they had three turnovers to only two points while UNT was chipping away at the lead. Shortly after, the ‘Runners were able to clean up their mistakes and go three for three on the following shots. Going into the half, the Roadrunners had a slim 31-33 lead over the Mean Green. Sophomore forward Marie Benson had 10 points and seven rebounds in the first half while Heineman had 11 points on four out of five shots. Offensively the ‘Runners shot 46 percent from the field and 75 percent from beyond the arc, while on the other side UNT shot only 33 percent from the field and 29 percent from beyond the arc. The Roadrunners also out-rebounded the Mean Green 23-15 but had more than twice as many turnovers as UNT. The ‘Runners got off to a hot start in the third quarter, as they went on a 9-0 run in the first three minutes. 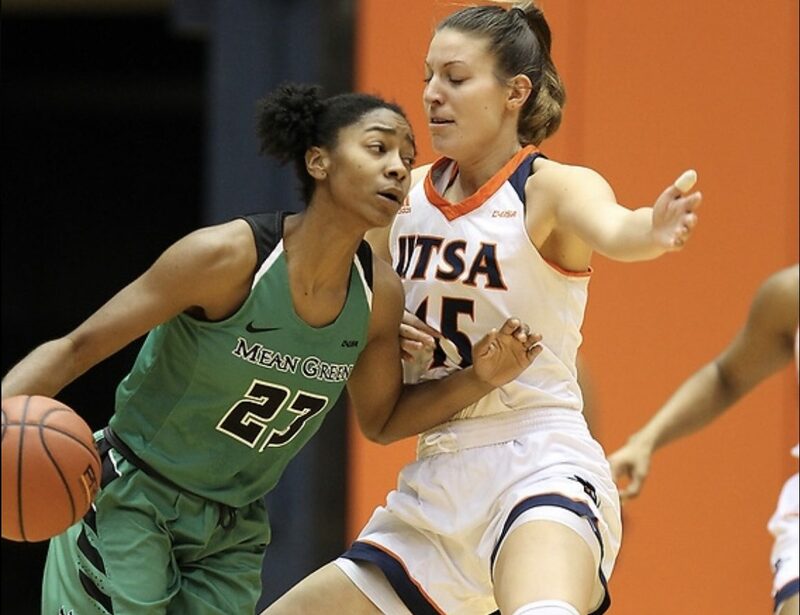 Desperate to stop the Roadrunner offense, the Mean Green went into a press defense, but it was no match as UTSA carved through the defense with ease as sophomore forward Tija Hawkins found junior forward Kourtney Kekec for an easy basket. UNT didn’t score their first basket of the second half until there was 3:25 left in the third quarter. UTSA led by two at the start of the third quarter, but by the end of the quarter they led by 16 with Heineman leading the team overall with 16 points on 5-6 shooting. The Mean Green started off the fourth quarter on a 11-4 run while carving further into the UTSA lead. With less than five minutes left in the game Hineman, hit a three from the corner to give the Roadrunners an 11 point lead. UNT got into foul trouble late in the game with more than four players with at least four fouls each. 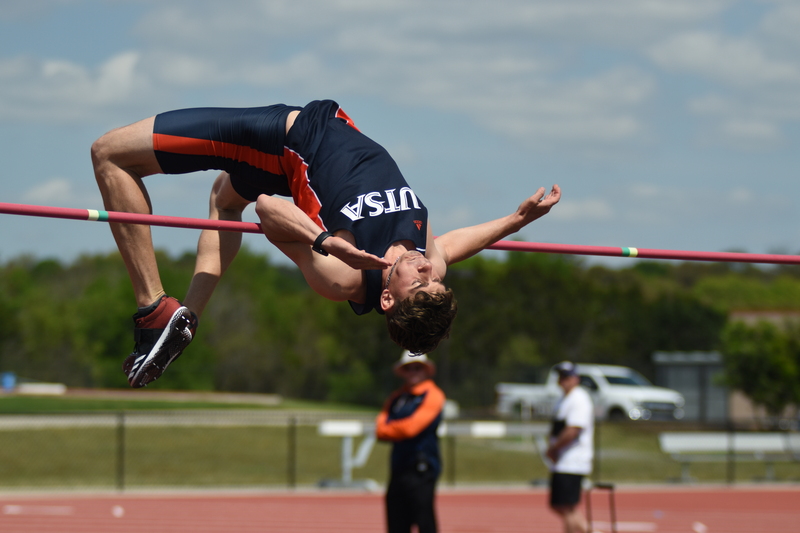 As the game started to wind down, the Roadrunners clung to a 10 point lead. With less than a minute left, UTSA had phenomenal time management and were able to eat up a good chunk of time and secure the win by defeating the Mean Green by a score of 58-70. With the win, the Roadrunners end their four game skid and are now 2-7 in conference play while UNT falls to 2-7 in conference play as well. Marie Benson ended the game with a double-double by scoring 19 and having 10 rebounds while Carlie Heineman had a strong performance by going 6-7 from the field and 5-5 from the three-point line. The UTSA defense showed up big by holding the UNT offense to only 32 percent shooting and forcing nine turnovers and out-rebounding the Mean Green by a margin of 34-43. The Roadrunners also lead for 38:19 minutes of the game and shot 49 percent from the field. 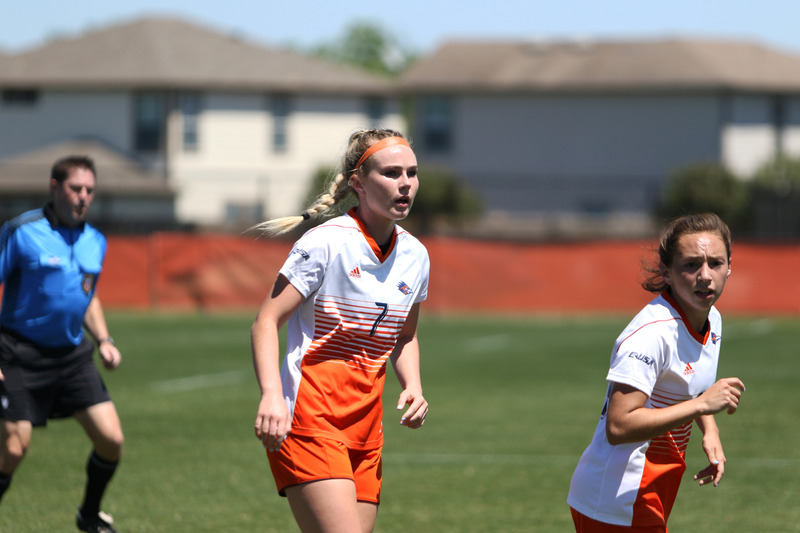 The ‘Runners will be back in action this weekend when they take on the UTEP Miners Sunday as the Conference USA season starts to wind down.